Those present: Fr. Grant Gerlach, Danny DeFries, Greg Lacey, Kay Birkholt, Alisa Birkholt and Joan Roe (recording secretary). Those absent: Gary Palo, Julie Hill and John Lane. The opening prayer was led by Fr. Gerlach. The minutes from the last meeting were approved by all with Danny making the motion to accept the minutes and Alisa seconding. The main reason: He, as pastor, desires to celebrate Mass with the whole parish in Hot Springs, not just part. He will not travel to three places on Christmas Eve: cannot reasonably celebrate three Masses in 6 hours in three different locations, even more so during winter. 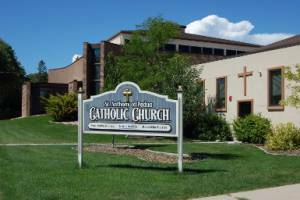 Custer’s church building is too small to have just one Mass for Christmas. There is a shortage of priests. Fr. Gerlach was asked if he has reached out to the Flemings. He stated he has not. He did mention that he recently found out from Joan that Mike is still taking care of the parish website. There is a program through Amazon where a person can give to a non-profit organization with their purchases. It was mentioned that possibly St. Anthony’s could benefit from this. Money would be deposited into St. Anthony’s checking account on a quarterly basis. Kay will work with Joan to get this set up. However, we also want to keep in mind that we need to “shop locally”. Alisa asked Fr. Gerlach when we might start a parish-wide study of some sort. We are called to continual formation and we need to widely communicate our plans with our parishioners in all sorts of ways: bulletin blurbs; TV screen, table tents, email and possibly snail mail. There is a possibility that we could begin with the program called “Forgiven” during Lent. Fr. Gerlach mentioned to the Council members of the upcoming “Living the Mission” Capital Campaign for the Diocese. The next meeting will be held Thursday, January 10, at 6:15 p.m.